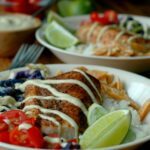 Quick prep “fish taco” inspired Buddha bowls the whole family will love! Let’s give dinner a little change up! I get it. We all have been there. Just because food bloggers make meal time look effortless, doesn’t mean we don’t struggle with meal planning sometimes. Many of us still have a houseful of kids with normal busy lives and schedules, and that means dinner ruts – even for a food blogger. The busy mom’s answer to any meal! Breakfast, lunch, or dinner, when I’m in a rush and need something fast for a meal, the ever popular “Buddah bowls” are the answer. I consider myself somewhat of an expert at piling high my biggest bowls with whatever I can to make a meal – having 3 kids in the space of just over 4 years will do that to you! Meal bowls, (or “Buddha bowls” if I want be popular 😉 ) are quick and easy to make, and can be customized to whatever is in season or in your fridge this week. How to customize buddah bowls for little kids! Listen, I love myself a good crisp, raw salad, or a buddah bowl crammed with crunchy coleslaw and slivers of raw veggies. And even though my kids are open to meal bowls with raw veg and salads/slaws, I am here to tell you that using roasted/cooked veg in your buddah bowls will get WAY more veg in the kids – especially the really little guys. Don’t wait to serve buddah bowls to your kids until they are older and can handle chewing raw veg. Get a little bowl in front of those older babies and toddlers with a variety of roasted vegetables and meat, and let them have at it two fisted! 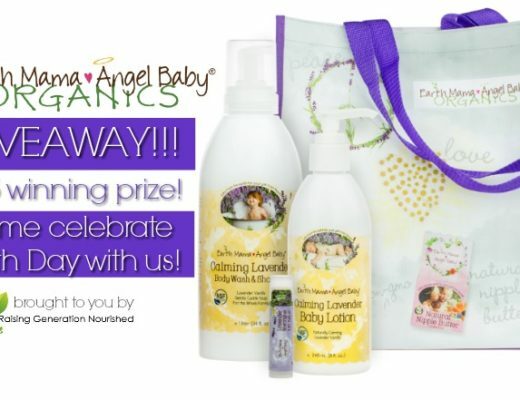 They will be so used to eating them at those young ages, that they won’t bat an eye at this being a regular rotation in your meal plan – and that, dear momma, is a priceless time saver. Because most nights, I certainly don’t have time to sit at the stove at cook…I love my sheet pans! Pile a load of your favorite veggies right on, and you are hands free while it roasts right along with the fish. Not only is this method time saving, roasting gives veggies a super kid friendly sweet flavor that irresistible. The meal possibilities are endless with that veggie bin full of produce! 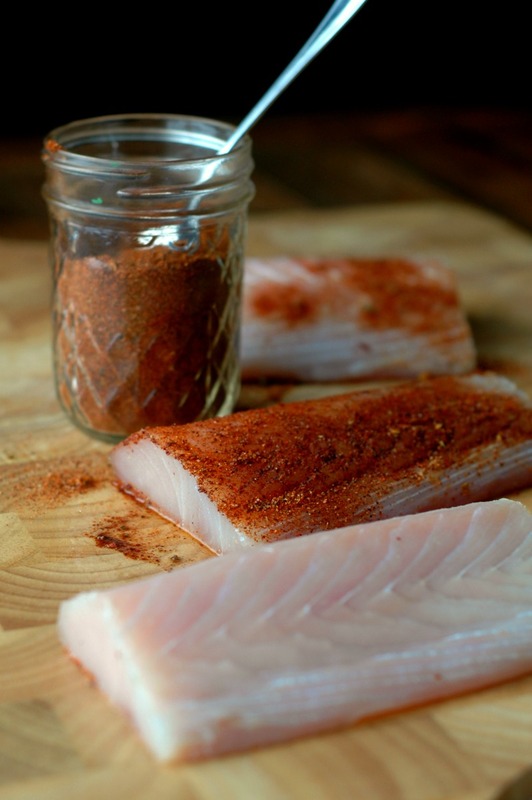 While we really love the mild taste and light texture of mahi mahi, if you don’t have access to a wild caught source of mahi mahi, by all means use what you have. Wild cod and wild salmon will work, and if there isn’t a safe source of fish near you, swap the fish for whatever quality meat you love to eat in your house. We are pretty thankful to have sustainable source of wild caught fish mongers in our area, but that is definitely not the case everywhere. 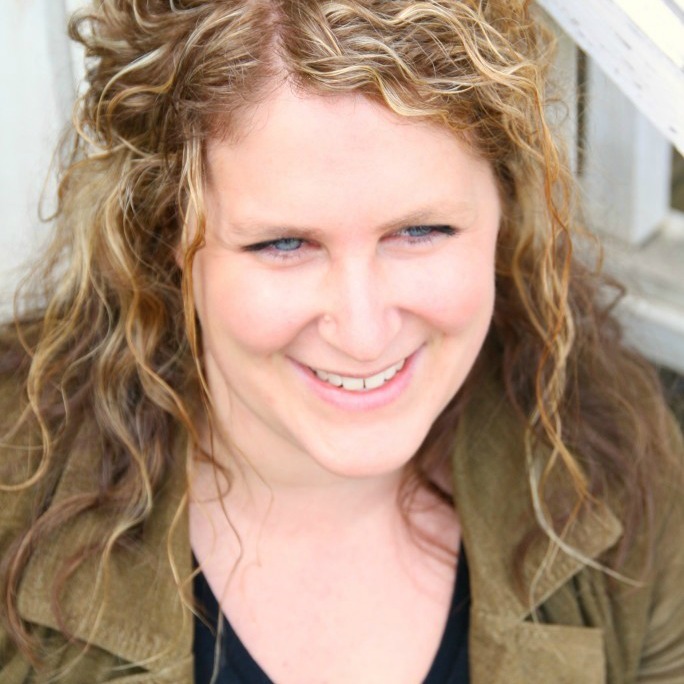 The demand is growing however, so don’t be afraid to look at even regular grocery stores. Our Meijer carries wild salmon, and many times we pick up our wild caught fish at Costco. If you don’t have access to beneficial fatty fish, using a quality cod liver oil in your house regularly will ensure you and the kids are getting the DHA and EPA oils that are so important for nervous system function. One of my biggest goals for this particular meal, was to keep the ingredient list to a minimum. Which means go ahead and use that taco season blend you love, dear momma! I keep a tripled up batch of my DIY taco season blend in the pantry so it’s easy to scoop from, or you could keep your favorite brand on hand. 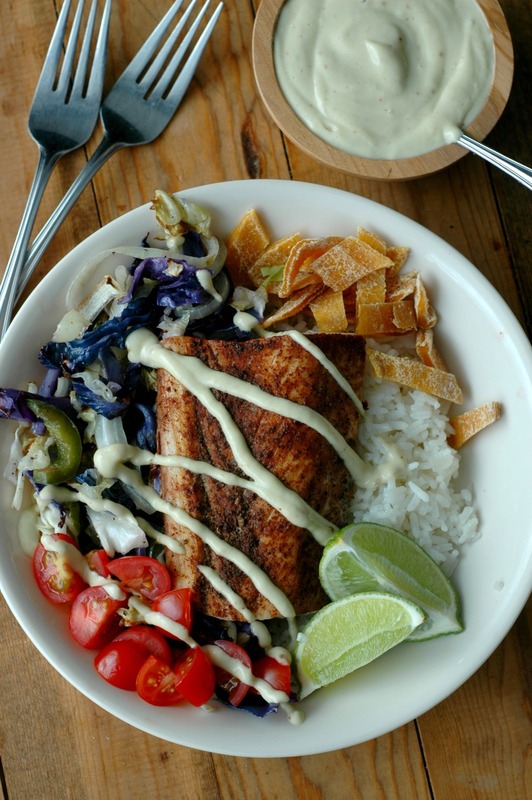 So let’s talk about this dreamy aioli to drown your fish taco bowl in! 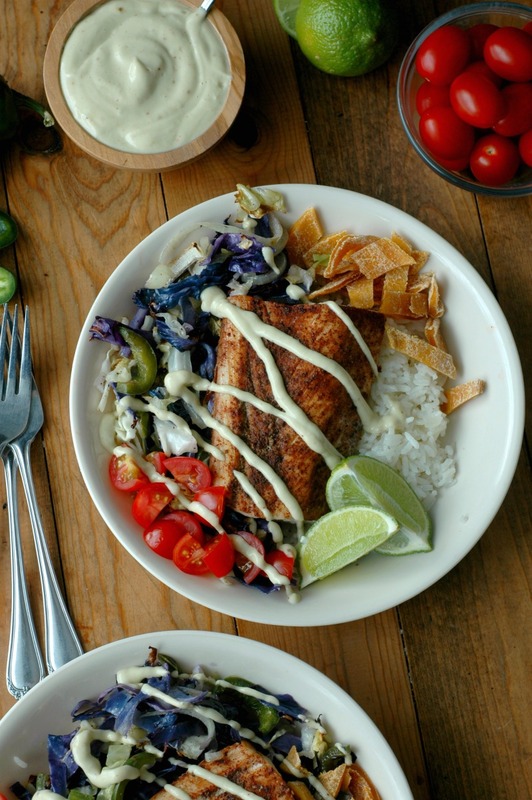 Honestly, I’ve been putting it on just about everything I can lately, from this sheet pan fish taco bowl, to salads, wraps, and even as a dip for homemade french fries. 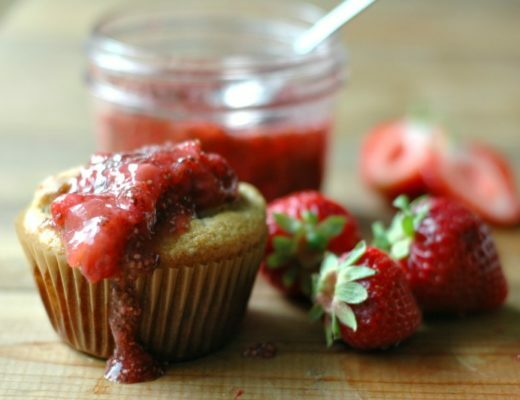 Creamy and flavorful without the dairy or additives, it almost feels too good to be true! I have one “not” spicy fan in the house – this creamy sauce is mild enough for her and should work for most kiddos. You can halve the chipotle to start with just in case, however. All 3 of the girls were licking their bowls clean on this one! The sky is the limit here! Our family tolerates an organic long grain white rice just fine, but there are so many different delicious options for serving your buddah bowls with! And while I would love to sprinkle fresh mango or pineapple over our bowls, winter in Michigan yields over priced fresh tropical fruit, so dried fruit is just as delicious, and keeps my budget happy. The brightness from the fruit also keeps the kiddos smiles around making dinner a bit more fun. Pre-heat the oven to 425. You can also get your rice cooking at this time if you are serving your bowls with rice – it will be done by the time you finish the fish! Season both sides of the mahi mahi with taco season, and place on a sheet tray. 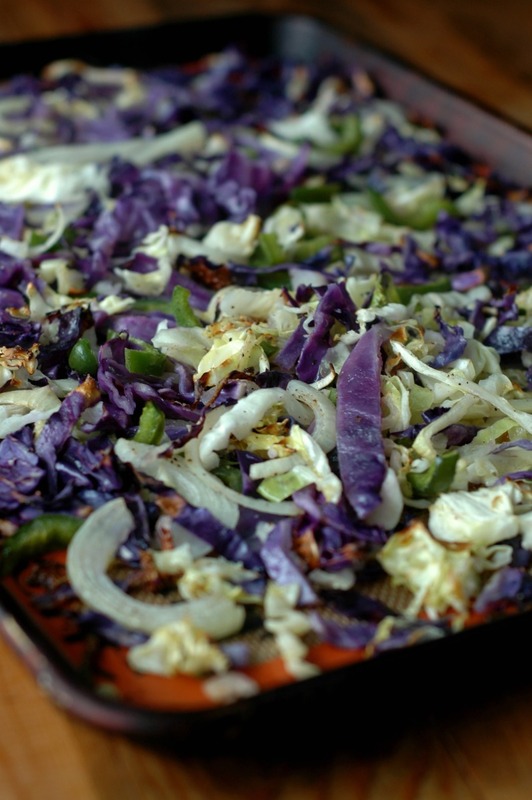 Toss the cabbage, onion, and jalepeno slices with avocado oil, sea salt, and pepper and spread out on another tray. Place the veggie tray on the middle rack of the oven, and the fish on the rack below that. Bake at 425 degrees for 25 minutes, until the fish is cooked through, and the veggies are lightly caramelized. While the fish/veggies are baking, you can make the aioli. 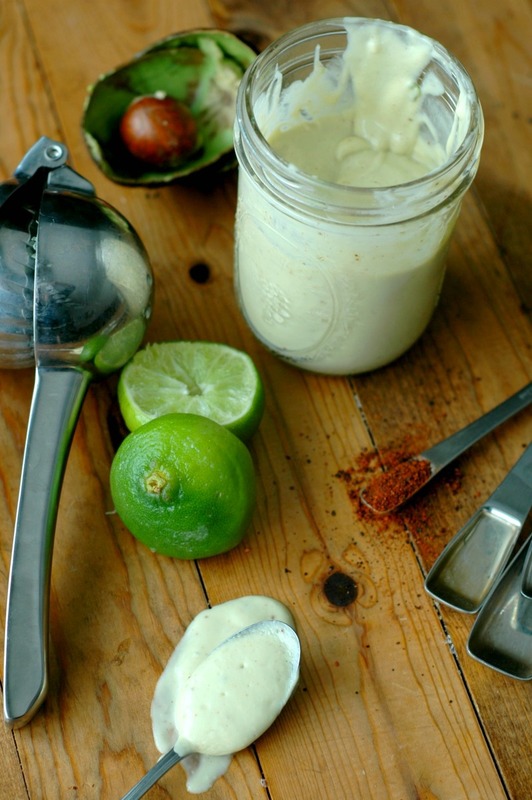 Place all of the aioli ingredients into a pint mason jar, and use an immersion blender to blend into a creamy sauce. If you do not have an immersion blender, put everything into your food processor EXCEPT the oil. Press blend, and then use the oil drip cup to slowly drizzle the oil in as it is blending so it can emulsify. After the fish/veggies cook, you can assemble your bowls. Veggies and rice (or cauli-rice) down first, and everything else surrounding it! Drizzle the aioli and serve with lime wedges. What a beautiful bowl! My grandkids would love this meal! I have to say, this is probably the best looking buddha bowl I have seen – because you keep it family friendly! And it’s pretty! 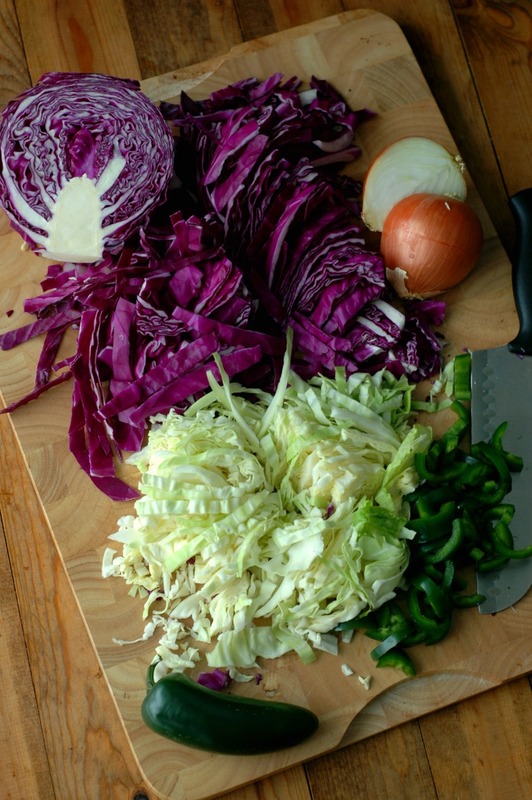 I love that you cook those veggies first, such a great idea! So fun with the dried mango in there too. YUM!!! Mahi mahi is my favorite! Definitely going to make this! Looks incredible! Fish tacos are my go to at Mexican restaurants so I be I would love this bowl version. SHEET PAN DINNERS! For the win! these look so delicious, I have some salmon in my freezer! MMMM! Looks SO darn good…and you are So right, the easiest meal to throw together!! Love! 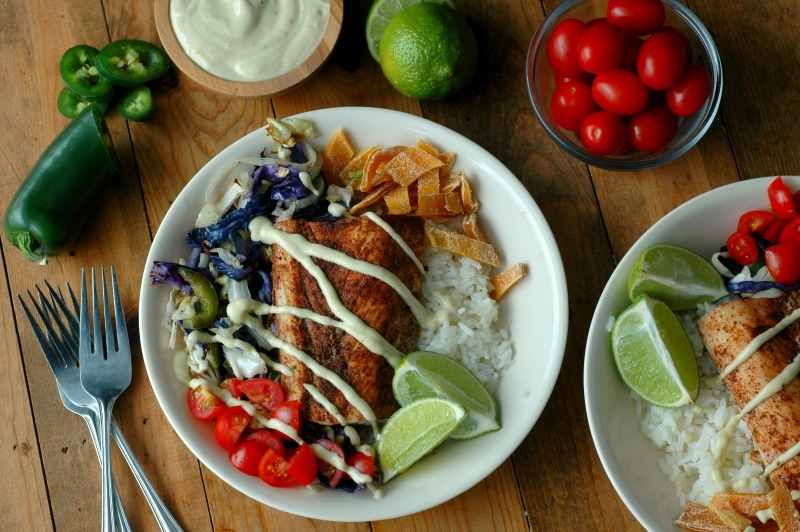 Fish taco in a bowl – what a great idea! The kids can even help make this healthy and easy recipe 🙂 That aioli is totally the star of the dish! Looks divine! It’s so colorful and fun! Definitely gonna make this and add extra aioli! Yes, love your idea of using roasted veggies in this context! The question is: how do I reach right through the screen to serve myself this beautiful meal?! 😉 We love fish so much, and this is a beautiful way to serve it! Ha! Love it 🙂 Thank you! I love that Buddha bowls can be customised. It’s easy to throw whatever you’ve got handy. Your tips for using a fun multi-purpose spice blend and topping it with an awesome aioli really keep this exciting. It also reinforces the idea of meal prepping on an individual food basis rather than with whole meals so you can rework them into new bowls later. Love it! Mahi mahi is DELISH! This recipe looks awesome! 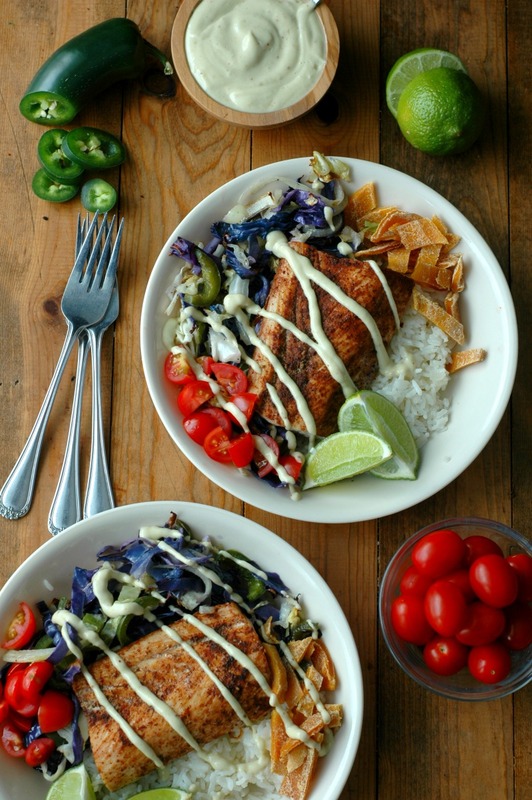 Ooh, I love a buddha bowl and I also love a fish taco… bringing them together is a WONDERFUL idea! I’m also pinning your taco season mix for more recipes too! Great idea – we love foods in bowls and this is perfect for us – plus I’m always trying to get the kids to eat more fish. Going to give this a try, thanks! All of the yums! This looks so delicious – great for a quick and easy weeknight meal! This looks so refreshing, but also so filling and nutritious! Love all of the add-in recommendations – really easy to keep this both seasonal and balanced! 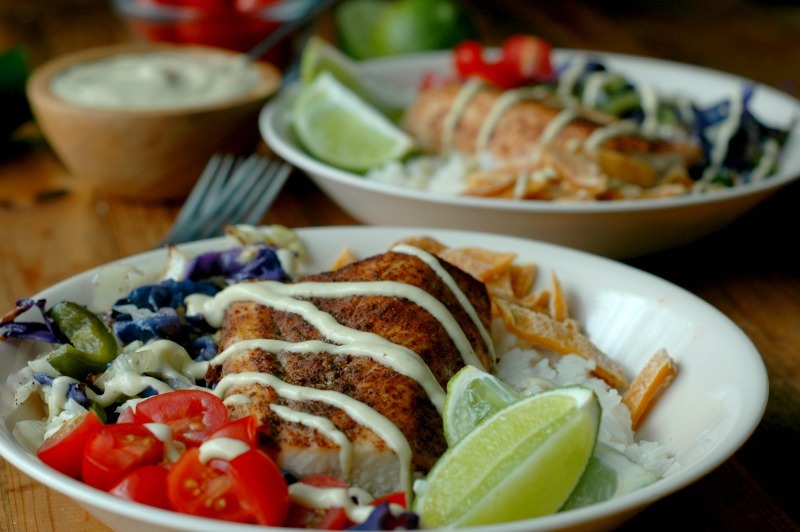 I love fish tacos and bowl food, so this is the perfect recipe to have both at once! This looks incredible. Great ideas for getting the smallest family members to get used to eating food like this from a young age! In my house, one of my kids loves vegetables and doesn’t like fish and the other doesn’t love vegetabes and likes fish! Go figure. Love me some chipolte anything! And you can’t go wrong with mahi! I’ve been trying to eat more fish, and this whole bowl looks so delicious! I always need a new fish recipe and this is perfect ! These looks absolutely beautiful! 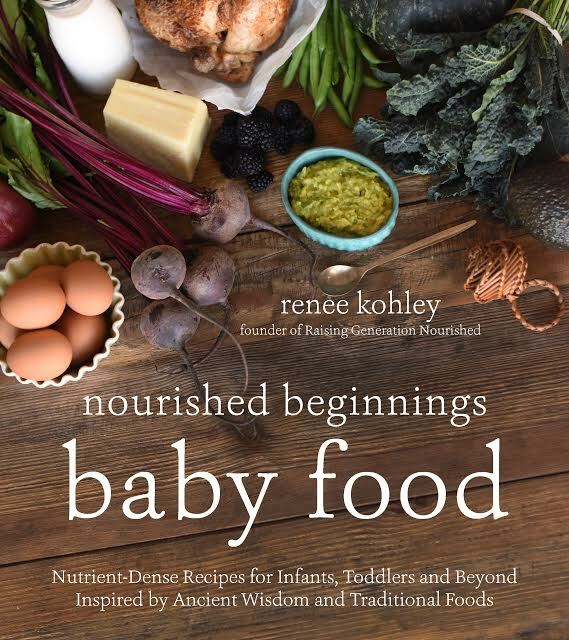 Love these hearty nourishing meals! Yum! My son has been asking me to make fish all week and this looks perfect! Well this is five stars even without the aioli! Toddler antics wouldn’t allow the time for it so we ended up with the roasted fish and cabbage with cherry tomatoes, black beans, avocado, squeeze of lime and salsa. I can’t wait to add the aioli and some mango!